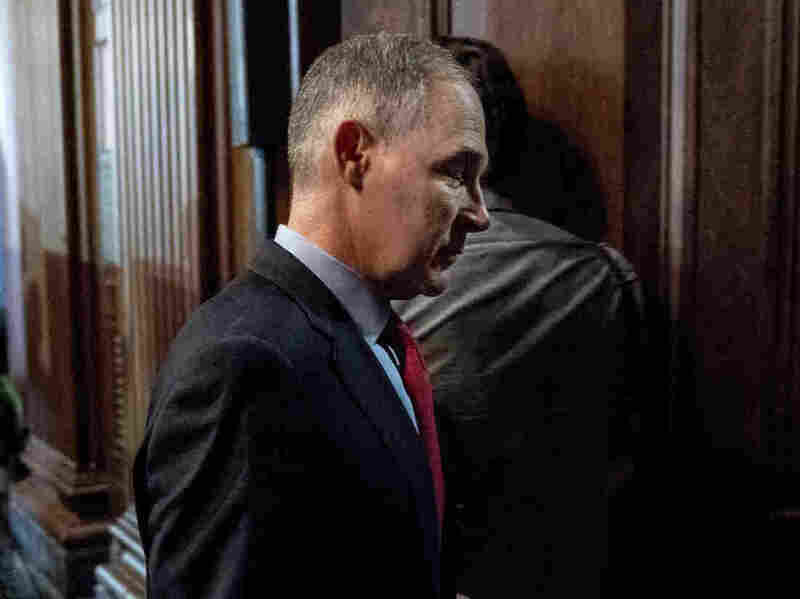 Scott Pruitt: EPA Chief Faces Mounting Scrutiny For Ethics Violations Environmental Protection Agency Administrator Scott Pruitt is fending off accusations that he misused taxpayer funds and maintained improper ties to companies regulated by the EPA. Environmental Protection Agency Administrator Scott Pruitt is facing investigations into his use of taxpayer funds for security and travel along with scrutiny of his ties to industry lobbyists. The scrutiny began months ago — the EPA Office of Inspector General started investigating Administrator Scott Pruitt's travel expenses in August 2017, after reports that he spent thousands of dollars on first-class plane tickets and a 24/7 security detail. But in recent weeks, a steady string of reports has painted a broader picture of a public servant with close financial ties to the industries he regulates and a desire to reward political appointees at the agency he runs. On Tuesday, The Atlantic reported Pruitt had sidestepped the White House to give substantial pay raises to two EPA staffers. Both are political appointees who worked with Pruitt in his previous position as state attorney general in Oklahoma. After the White House declined to approve the raises, Pruitt used a provision meant to help the EPA hire environmental experts to gain full control of the political staffers' salaries, and authorized their raises. Pruitt previously used the same provision to hire Nancy Beck, a longtime lobbyist for the chemical industry, to oversee toxic chemical regulation for the agency. The EPA inspector general announced earlier this year that it would audit the use of what are known as administratively determined positions under Pruitt. According to the inspector general's office, that probe was set off in part by a request from congressional Democrats, questioning whether the administrator's hiring practices were in line with ethics rules. Beck's appointment was also emblematic of Pruitt's close ties to the industries he is bound to regulate. A top coal lobbyist is awaiting confirmation as Pruitt's deputy, and E&E News reported more than a dozen former energy lobbyists have landed other positions at the agency. When Pruitt ran for office in Oklahoma, he hired an oil billionaire to run his re-election campaign and used his position to sue the EPA to stop ozone and methane emissions rules and block regulations on coal-fired power plants. The most recent lobbying controversy was reported last week, when ABC News found Pruitt had been paying to stay at a Washington, D.C., condo owned by the wife of a lobbyist for multiple energy companies including the liquefied natural gas company Cheniere Energy. Until March, Cheniere owned the only natural gas export terminal in the U.S. Last year, Pruitt traveled to Morocco and discussed boosting the country's natural gas imports, according to an agency press release. The New York Times reported the same lobbying firm also represented a Canadian company responsible for a massive pipeline spill in Michigan for which the Obama administration fined the company $177 million. Last year, the EPA signed off on a pipeline expansion project by the company. Separately, the District of Columbia's Department of Consumer and Regulatory Affairs said on Twitter it would investigate whether the condo was approved to be rented on a per night basis, which is how Pruitt paid for his lodging. In a statement, an EPA lawyer defended the lease agreement, saying it was "consistent with federal ethics regulations regarding gifts." Meanwhile, the EPA inspector general has widened its investigation into travel and security expenses multiple times, and the audit now includes the administrator's trip to Morocco. Last week, CNN reported that Democratic Sen. Sheldon Whitehouse of Rhode Island turned over evidence to the inspector general that Pruitt had used his security detail on personal trips including a family vacation to Disneyland. Kentia Elbaum, a spokesperson for the EPA Office of Inspector General, told NPR the office "anticipates issuing a final report during early summer 2018," covering the administrator's travel through December 2017, but warned that the timeline could change. Environmental groups are pushing for Pruitt to be fired, but so far it is unclear how recent scandals have affected his standing in the administration. A White House official confirmed to NPR that President Trump spoke with Pruitt on Monday but did not say what the two discussed. Asked about his support for Pruitt on Tuesday, the president told reporters, "I hope he's going to be great." The ethics issues do not appear to have undercut Pruitt's ability to deliver on his promises at the EPA, which hinge on environmental deregulation. He has rolled back or begun the process of repealing multiple major Obama-era regulations, including limits on power plant emissions and water pollution. The Trump administration has declared it will not honor the Paris climate agreement and, just Monday, the agency announced it would weaken emissions standards for cars and SUVs, undoing another signature climate change policy from the previous administration. A previous version of this story incorrectly stated that Cheniere Energy owns the only natural gas export terminal in the U.S. A second terminal owned by a different company opened in March 2018.